Missouri is home to more species than almost any other state in the union. Our fragmented and highly varied topography has led to many, many small, isolated areas in which evolution occurred along slightly different paths, leading to small communities of unique species. How well are we doing at protecting this biodiversity? One way to assess how well we are protecting our biodiversity is through a gap analysis. The National Gap Analysis Program of the United States Geological Service (USGS) is intended to improve conservation practices by using the following process: first construct a map detailing land cover. Second, construct a map showing the distribution of animal and plant species. Third, construct a map showing the location and conservation status of protected areas. Fourth, use this data to identify gaps where target ecosystems and species are inadequately covered by conservation efforts. It sounds simple, but the process of doing it is quite complex. 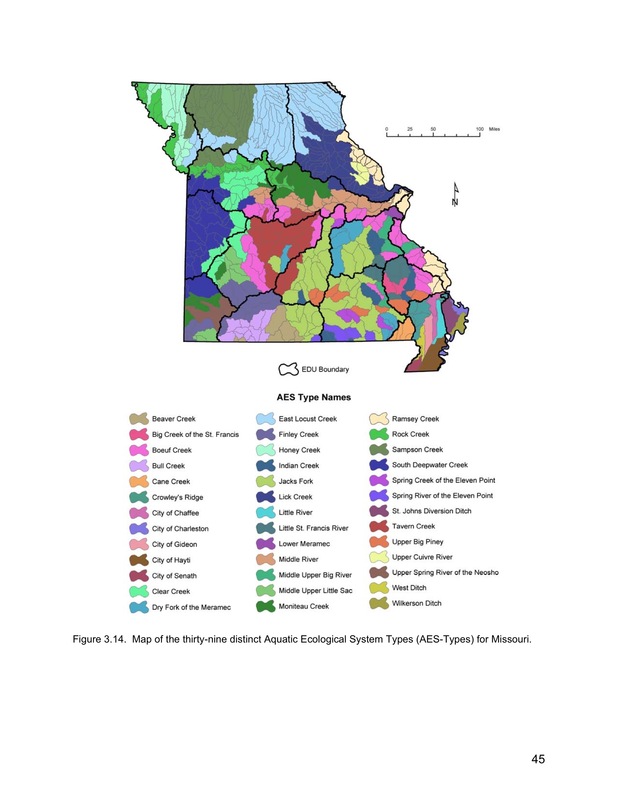 Figure 1: Missouri Ecological Drainage Systems and Aquatic Ecological System Types. Source: Sowa (2005). Gap analyses are sometimes made separately for types of ecosystems. A Gap Analysis for Riverine Ecosystems of Missouri was published in 2005 by the USGS (Sowa, 2005). It constructs a gap analysis for Missouri’s streams. The authors constructed an 8-level classification hierarchy that could be used to map Missouri’s streams across the dimensions above (land cover, distribution of species, location and status of protected areas). I’m not going to explain all of the details here, but I do want to illustrate how their analysis proceeded. 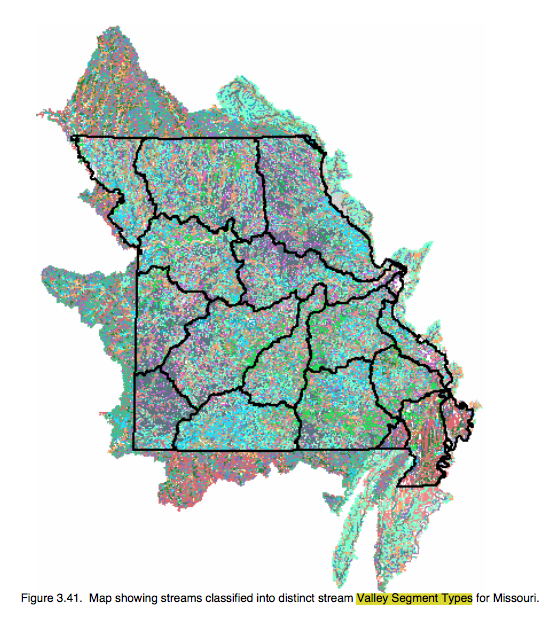 Missouri is generally divided into three great hydrologic subregions. In the bootheel is the Mississippi Alluvial Basin. The Central Plains region lies north of the Missouri River and also wraps southward along the border with Kansas. In between is the Ozarks Region. If you have travelled in these regions, perhaps it was obvious to you that the streams in each one are quite different in character from those in the others. The authors divided these three regions into Ecological Drainage Units. There were 19, and they are shown in Figure 1, delineated by the heavy black lines. These were further divided into 39 Aquatic Ecological System Types (AES-Types). Each AES-Type represented one or more drainage areas containing a small or medium, river with a unique combination of physical habitat, water chemistry, energy sources, hydrologic regime, and community of plants and animals. In Figure 1, the grey lines delineate the AES drainage areas, and the color codes for the AES-Type. AES-Types don’t have to be contiguous, they can be physically separated so long as they contain the same characteristics. Figure 2: Missouri Valley Segment Types. Source: Sowa 2005. The authors then divided the AES drainage areas into even smaller units called Valley Segment Types (VSTs). VSTs were small reaches of streams that had similar characteristics. They identified over 100 different VSTs, and assigned them to literally thousands of small stream segments throughout the state (Figure 2). The hypothesis of the analysis was that in coarser grained analyses, AES-Type would determine the species of plants and animals found within it, and that VST would play the same role in a finer-grained analysis. These analyses were then combined with management information about each stream segment. This primarily represented factors that either harmed or endangered the ecological diversity of the stream segment, like human encroachment, agriculture, and mining, or factors that protected the diversity of stream segments, like inclusion in a national forest, state park, or conservation area. Figure 3: Human Stress Index. Source: Sowa 2005. 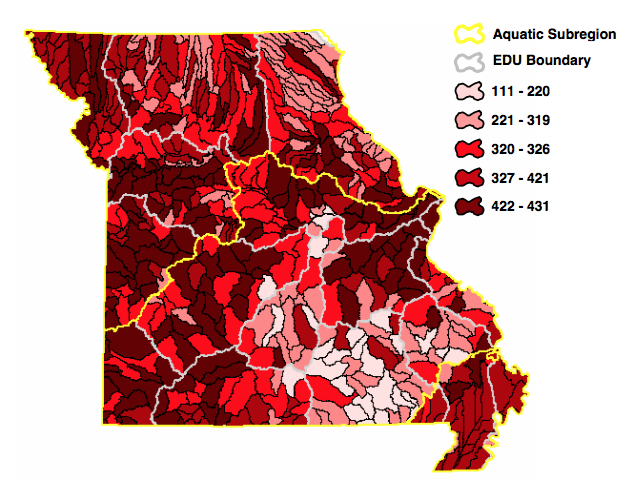 The authors represented the degree to which human activities impaired stream diversity by constructing a Human Stress Index, and Figure 3 shows the Human Stress Index for each of the AES drainage areas in Missouri. The higher the index, the darker the red, and the higher the degree of human disturbance. Figure 4: Percentage of VSTs with Gap Status of 1 or 2. Source: Sowa 2005. The gap analysis used a scale of 1-4 to rate the relative degree to which biodiversity was protected in each AES-Type and VST, with “Status 1” being most protected and “Status 4” being least. Figure 4 shows the percentage of VSTs in each Ecological Drainage Unit that were rated Status 1 or 2. As you can see, most of the EDUs had very low percentages of VSTs rated 1 or 2. Only those deep in the Ozarks had percentages above 26.5%. To some extent, this finding should be expected; one would not expect urban or agricultural land to support the complex biodiversity that undisturbed land does. But the report puts numbers to that impression, and the result is not encouraging. There is a great deal of additional information in the report, but it is complex and very detailed, and this post is already long enough. Those who have particular interests in biodiversity in Missouri should look up the report. Sowa, S. P., D. D. Diamond, R. Abbitt, G. Annis, T. Gordon, M. E. Morey, G. R. Sorensen, and D. True. 2005. 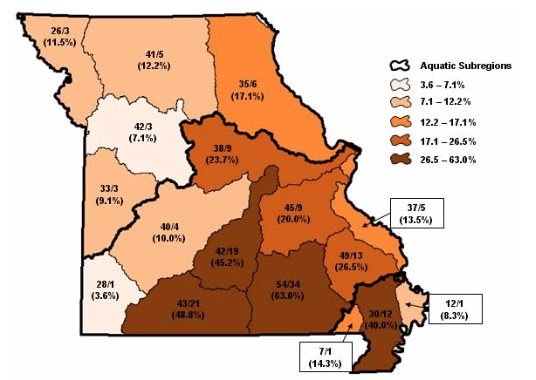 A Gap Analysis for Riverine Ecosystems of Missouri. Final Report, submitted to the USGS National Gap Analysis Program. Downloaded 6/23/2016 from https://morap.missouri.edu/index.php/aquatic-gap-pilot-project. By mogreenstats in Land, Other Water, Water on 2016/07/21 .